Peter Early (Pearley on the forum) and his wife Jeanette live a nomadic life as genuine continuous cruisers. They’ve been cruising the network non stop since their new boat was launched in 2007. It’s a lifestyle many boaters aspire to. About 10 years ago a good friend died. He was only a year older than me and it made us think that there were other things we wanted to do rather than working. An opportunity came to sell our business and in 2007 with no family ties we had Joanie M built for us and sold our house. What is your boat called and why did you decide on that name? ‘Joanie M’. We wanted to call the boat after Jeannette’s mum. There were several Joans on the register, 2 or 3 Joanies so we added the M, for Maurice, Jeannettes dad, to make the name unique. Do you have a permanent mooring? Continuous Cruisers although we have sometimes taken a winter mooring, on one occasion taking and paying for it then getting stuck in the ice about 5 miles from getting there! 57 ft 6 ins trad. How long have you been a narrowboat owner? How did you finance your boat? From the sale of house. How much time do you spend on your boat each year? No. Retired vehicle electrician so at least I know how to look after my batteries. What do you like least about narrowboat life? What do you like most about narrowboat life? Freedom. We get to see different parts of the country, if we don’t like the view we can move, if we don’t like our neighbours we can move. If you could change just one thing about your boat, what would it be? When you are cruising how do you resupply (How do you get to the supermarket without a car)? Walk but often use supermarket delivery services for wine! When your stuck in the ice you tend to drink more! How do you do your washing when you are cruising? What type of toilet do you have on board and are you happy with it? Dometic vacuum cassette. Gives conventional style bowl at normal height. Yes very happy although like every other boat toilet it has its peculiarities. If it is going to play up it will be when we have visitors. How do you connect to the internet when you are on your boat and are you happy with the service you receive? T Mobile wireless pointer. Makes inside of boat wireless. What is your favourite canal or section of canal? How do you generate electricity when you are cruising and how much do you use? Joanie M is gas free so have a 7 kVa diesel generator built in. How warm is your narrowboat in the winter? 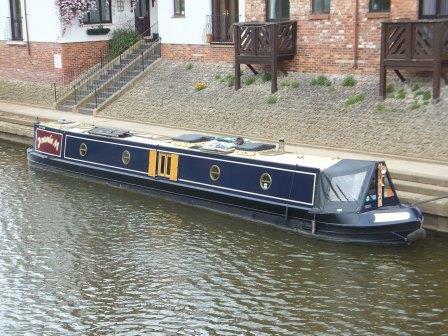 What advice can you offer someone considering living on a narrowboat? Try it out before committing, not just in the summer but during the winter months. Are you one of the lucky few who lives the dream on board your own narrowboat full time? Would you like to share your experience with some of the thousands of potential floating home owners who visit this site? If you can spare the time to answer a few simple questions, I would love to hear from you. Just let me know so I can email the questions to you. I’ll create a post like the one above complete with a link back to your own blog or website. Enter Your Name and Email Address Below to Download Your Information Packed Narrowboat Guide!